A former England footballer has been set free again despite admitting breaching a suspended jail sentence. Gary Charles, 36, of Stretton, near Alfreton, got the nine-month sentence for attacking a woman in a taxi office. An arrest warrant was issued when he did not show up at Derby Crown Court on Monday to explain why he missed two probation service appointments. On Tuesday the judge ordered him to continue doing community service, which was also part of the sentence. But Judge Andrew Hamilton warned Charles he would be sent to prison if he could not meet the terms of the order. He told him to reappear before the court in December. The self-confessed alcoholic handed himself over to police at the court on Tuesday morning and insisted he simply got his dates mixed up. 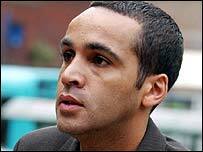 He played for Derby, Nottingham Forest and Aston Villa and retired in 2002. Charles was found guilty of assault occasioning actual bodily harm after a three-day trial at Derby Crown Court in July. Derby Crown Court had heard how Charles attacked Elizabeth Wedge, 42, after she joked he was not good enough to play for Manchester United. He repeatedly kicked her in the face and head in the 2005 assault. Charles was sentenced to 100 hours community service at a hearing in Nottingham and given a suspended nine-month sentence.